The Nebraska state seal identifies government buildings and officials and is a centerpiece for the Nebraska state flag. The symbolism, history and emblems of the seal are described in this article with fast facts and information. Fact 1: Adopted in 1867 and was approved by Governor David Butler on June 15, 1867. The Rocky Mountains feature strongly at the top of the image with a steam train with carriages heading towards the Rockies emphasizing the importance of the railroad. The invention of steam power made it much easier to travel along the rivers, replacing the flat boats. Steamboats had a steam engine which turned a paddle wheel at the back of the boat, some had two paddle wheels on each side of the steamboat. The foreground agriculture is represented by a settlers log cabin, sheaves of wheat and stalks of growing corn. A flourishing tree represents the timber industry. 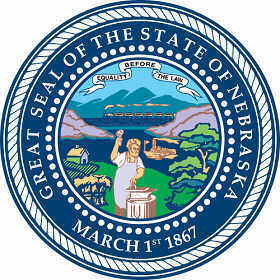 The Nebraska seal is kept and used as required by the Constitution and laws of the state. This is an early flyer that displays the 1913 design of the seal, which is extremely similar to the current version. A picture of Cottonwood trees, one of the largest North American hardwood trees that grow 20-45 meters tall, represent the logging industry and the silhouette of a lumberjack stands in the foreground. The other picture depicts Native American Indians talking to a frontiersman dressed in buckskin.